Located about 45 miles from Toledo in the town of Findlay, OH, the Church of God-affiliated University of Findlay offers a liberal arts education with a career-oriented twist to about 3,000 largely traditional undergraduate students. The University of Findlay offers an equine program, complete with full facilities. What is a typical The University of Findlay student like? Describe the type of person that should attend The University of Findlay. What are the top 3 reasons someone should attend The University of Findlay? What was a typical The University of Findlay student like in high school? Describe the type of person that should attend The University of Findlay. What are the top 3 things that students do for fun at The University of Findlay? 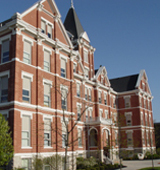 Campus housing is available for undergraduates. Housing deposit : $150.00. Housing deposit due : Jul 1. Housing deposit is not refunded if student does not enroll.. Freshman allowed to have car. No pets. The average student pays $21,107 for tuition, fees, and other expenses, after grants and scholarships. Total stated tuition is $28,894, in-state and on-campus, before financial aid. Learn more about financial aid at http://www.findlay.edu/offices/student/financialaid/pages/default.aspx. Estimate the net price for you at http://www.findlay.edu/offices/student/financialaid/pages/net-price-calculator.aspx. The typical (median) early career salary of The University of Findlay graduates is $40,500, according to Payscale. The University of Findlay participates in the NCAA Division II for college athletics. Want more info about The University of Findlay? Get free advice from education experts and Noodle community members. What are the requirements to be accepted into the physical therapy program at The University of Findlay? The University of Findlay offers an accredited doctor of physical therapy program with two options: a "traditional program" (with a direct freshman admission option) and a "weekend college program​".